Ludwig “Zirkus” Franzisket was born on 26 June 1917 at Düsseldorf. Fähnrich Franzisket was serving with JG 26 in 1938. On 1 August 1939, he transferred to 1./JG 1. He participated in the invasion of Poland and the Low Countries and France. On 11 May 1940, Franzisket claimed his first two victories. He ended the French campaign with nine victories to his credit, including two French LeO 451 twin-engine bombers shot down near Nesle on one mission and a French Morane fighter shot down near Roye on a later mission to record his 7th through 9th victories on 5 June. On 9 July, 1./JG 1 was redesignated 7./JG 27. 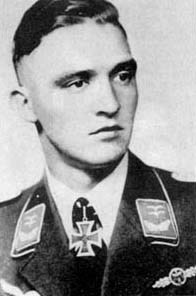 On 1 October 1940, Franzisket was transferred as Adjutant of I./JG 27. In spring 1941, I./JG 27 was relocated to North Africa. Franzisket had 14 victories to his credit at this time. On 14 June, Franzisket intercepted a lone RAF Maryland twin-engine bomber escorted by a Hurricane fighter. He shot down both aircraft. The Hurricane was piloted by South African ace, Captain Ken Driver (10 destroyed and 1 damaged victories) of 1 Sqn, SAAF, who baled out to become a prisoner of war. Oberleutnant Franzisket was awarded the Ritterkreuz on 23 July for 22 victories in 204 missions. Franzisket was appointed Staffelkapitän of 1./JG 27 on 6 December 1941. On 25 December, Franzisket was wounded when his Bf 109 F-4trop was damaged by flak 40km south of Agedabia. On 11 April 1942 he shot down a P-40 to raise his victory total to 30. On 29 October 1942, Franzisket was shot down in aerial combat with RAF Spitfire fighters. He baled out of his stricken Bf 109 G-2trop (W.Nr. 10616) but struck the tailplane breaking a leg. When I./JG 27 was withdrawn from North Africa at the end of 1942, Franzisket had 39 victories to his credit. From 1 July 1943, Franzisket led 1./Ergänzungs-Jagdgruppe Süd. He attended a fighter leader’s course from 15 July before being appointed Gruppenkommandeur of I./JG 27 based in Germany performing Reichsverteidigung duties. On 14 October, he claimed two USAAF B-17 four-engine bombers from the formations raiding Schweinfurt. On 12 May 1944, in aerial combat with four-engine bombers over Bad Orb, Franzisket’s Bf 109 G-6/U4 (W.Nr. 441097) was hit by return fire and he was badly wounded. He successfully baled out of his stricken aircraft despite his wounds. Following his recovery, Franzisket led the fighter leaders’ courses at Königsberg in Neumark from 1 October 1944. He was able to shoot down two USAAF B-17 four-engine bombers on 6 October. On 15 December 1944, Franzisket joined the Geschwaderstab of JG 27. He was appointed Kommodore of JG 27 on 30 December 1944.Franzisket died on 23 November 1988 at Münster. “Zirkus” Franzisket was credited with 43 victories in over 500 missions. He recorded all his victories over the Western front. Included in his victory total are four four-engined bombers.